BAGHDAD, Iraq, January 26, 2014 (ENS) – To restore Iraq’s deteriorating environment, the Government of Iraq has signed a landmark cooperation agreement with the UN Environment Programme to speed environmental recovery and support peace-building. 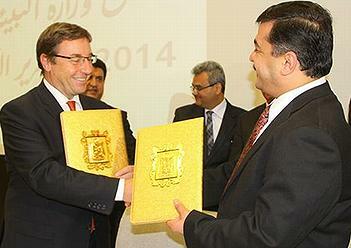 The agreement was signed Sunday at a special event hosted by Iraqi Minister of Environment Eng. Sargon Lazar Slewa to welcome UNEP Executive Director Achim Steiner on his first visit to Iraq. UNEP Executive Director Achim Steiner, left, with Iraq’s Environment Minister Eng. Sargon Lazar Slewa at the signing ceremony, Jan. 26, 2014 (Photo courtesy UNEP). The ceremony was attended by Iraqi cabinet ministers, parliamentarians, members of the diplomatic community and international organizations. “The well-being, security and livelihoods of Iraqis are dependent on our success,” said Slewa. The new five-year Strategic Cooperation Agreement with UNEP is intended to strengthen Iraq’s attempts to overcome the country’s many environmental challenges. Areas of cooperation defined by the agreement are: environmental legislation and regulations; biodiversity conservation; the green economy; cleaner production; resource efficiency; combating dust storms; and climate change reporting, mitigation and adaptation. “The commitment of the government to achieve environmental sustainability is clearly articulated in the vision, goals and objectives of the National Development Plan, which places the Green Economy at the heart of development and economic policies,” Steiner said. Cooperation between the Government of Iraq and UNEP dates back to 2003, immediately after the establishment of the Ministry of Environment. Since then, UNEP has worked with the Iraqi Government on projects such as, rapid post-conflict environmental assessments, environmental clean-up of contaminated sites, and the restoration of the Mesopotamian Marshlands. Iraq’s environmental health has declined in recent years, a decline worsened by decades of war and growing pressures on natural resources. A new government study, backed by United Nations and World Bank data, shows that years of conflict and violence have resulted in chemical pollution and unexploded ordnance, affecting the safety and lives of an estimated 1.6 million Iraqis. 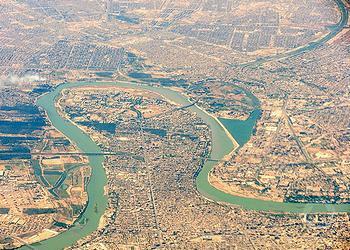 Population growth is pressuring Iraq’s food, water and energy resources. By 2030, the population is expected to grow to almost 50 million people. The study finds that five to eight percent of Iraq’s Gross Domestic Product is lost annually to environmental degradation. An estimated 39 percent of Iraq’s agricultural land suffered a reduction in cropland between 2007 and 2009. Meanwhile, food insecurity is increasing. The quality and quantity of the country’s water has been damaged by upstream damming, pollution, climate change and inefficient usage, the report warns. Around 31 percent of Iraq’s surface is desert. At the same time, 39 percent of the country’s surface is estimated to have been affected by desertification, with an additional 54 percent under threat. As a result of declining soil moisture and lack of vegetative cover, there has been an increase in the frequency of vast dust and sand storms, often originating in western Iraq. Sustainable access to safe water and sanitation remain a challenge – 83 percent of Iraq’s wastewater is left untreated, contributing to the pollution of Iraq’s waterways and general environment. Limited water supplies were reduced still further by a drought that lasted from 2005 and 2009. Over the longer term, the amount of water available per person per year decreased from 5,900 cubic meters to 2,400 cubic meters between 1977 and 2009. The Tigris and the Euphrates, Iraq’s two major surface water sources, may dry up by 2040 if current conditions prevail, warns the government report. The report, entitled “Iraq State of Environment and Outlook,” is available in Arabic only. It was prepared by the Government of Iraq with support from UNEP, the UN Development Programme and the World Health Organization.